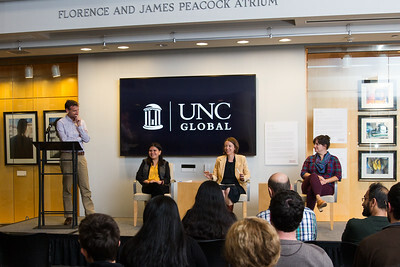 "Migration Narratives" highlights four projects undertaken by recent alumni, graduate and undergraduate students at the University of North Carolina at Chapel Hill to consider the local impacts of global migration. 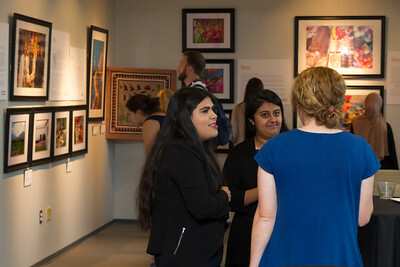 The exhibition was on display at the FedEx Global Education Center from Sept. 3 to Dec. 9, 2016. 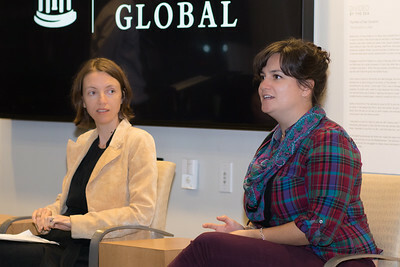 UNC Global hosted a reception and panel discussion on Nov. 3, 2016 celebrating "Migration Narratives." 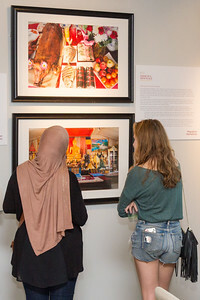 Guests enjoyed Laotian food as they viewed the projects on display, and learned more about stories of migration from each project in the exhibition during the panel discussion featuring key project producers and participants. 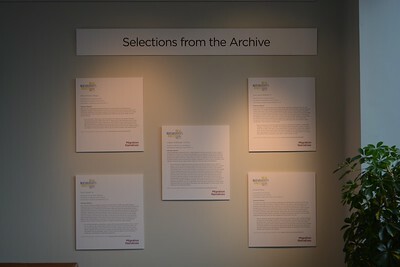 All photos by Alicia Stemper unless otherwise noted. Katy Clune ’15 M.A. 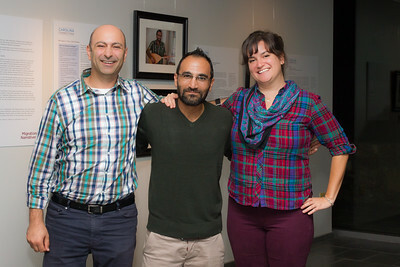 (right), Carolina Connections project researcher, joins Zubair ’18 (center) and Bahij ’17 (left) for a photo after the panel discussion. 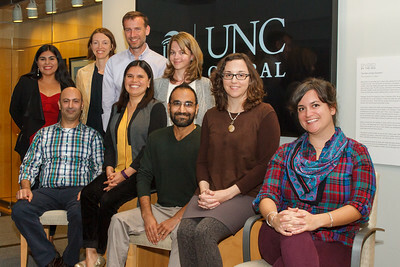 Latino Migration Project and New Roots/Nuevas Raíces staff pose for a photo. Zubair ’18 (right) and Bahij ’17 (left), current UNC students who were forced to flee the violence in Syria, are featured in the Carolina Connections exhibit. 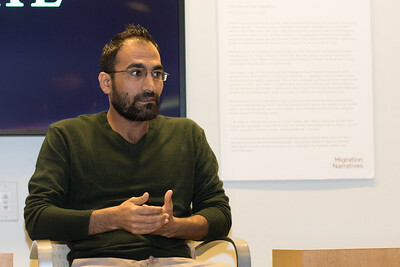 Zubair ’18, a current UNC student featured in Carolina Connections, discusses his experience as a Syrian refugee in North Carolina. Laura Villa-Torres, bilingual outreach assistant with New Roots/Nuevas Raíces, discusses the process of interviewing and archiving bilingual interviews of Latin American migrants in North Carolina. 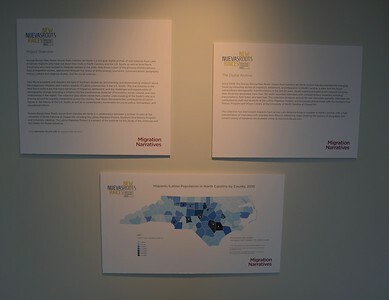 Hannah Gill, director of the Latino Migration Project and New Roots/Nuevas Raíces, speaks about why it is important to preserve the stories of Latin American migrants in North Carolina. 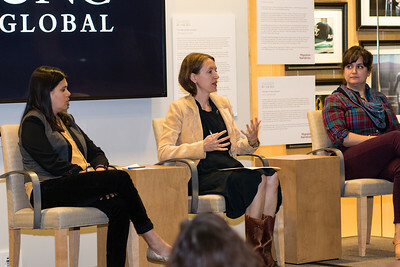 Niklaus Steiner (left), director of the Center for Global Initiatives, moderates a discussion between (from left to right) Laura Villa-Torres, Hannah Gill and Katy Clune ’15 M.A., three project researchers and producers who worked on projects featured in the "Migration Narratives" exhibition. Katy Clune ’15 M.A. 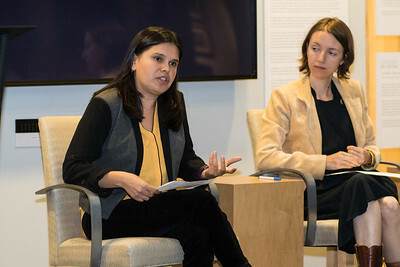 (right), project researcher and curator of Home in a New Place, and Hannah Gill (left), director of the Latino Migration Project and New Roots/Nuevas Raíces, discuss their work in chronicling the experiences of migrants in North Carolina. 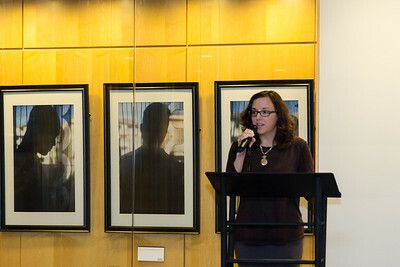 Katie Bowler Young, director of Global Relations, welcomes guests to the panel discussion with project producers and participants from the projects featured in the "Migration Narratives" exhibition. 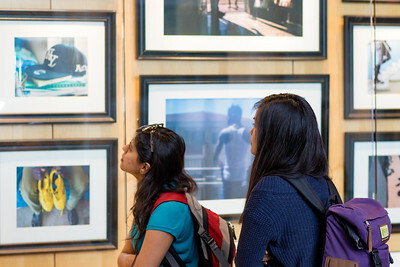 Thupten Norbu, interim director of Carolina Asia Center, views photos from Carolina Connections, a project featuring two current students at UNC-Chapel Hill who fled from civil war in Syria. 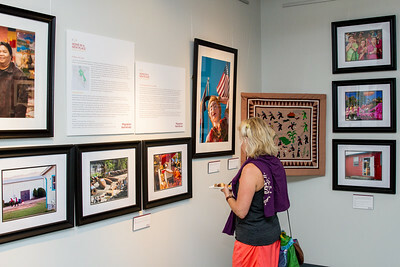 Guests view photos from the project Home in a New Place: Making Laos in Morganton, NC. A guest enjoys Laotian food and views photos from the project, Home in a New Place: Making Laos in Morganton, NC. Felicia Arriaga, a doctoral candidate at Duke University featured in the New Roots project, enjoys a conversation with guests before the panel discussion begins. Home in a New Place follows the Phapphayboun family, a Laotian family who brings their traditions to a Morganton, NC. 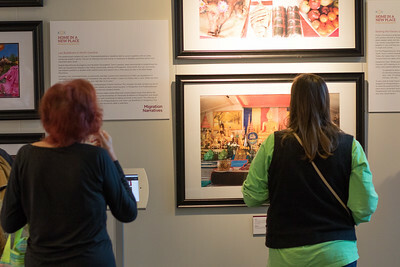 Guests learn about Laotian cuisine, clothing and traditions from the project, Home in a New Place. 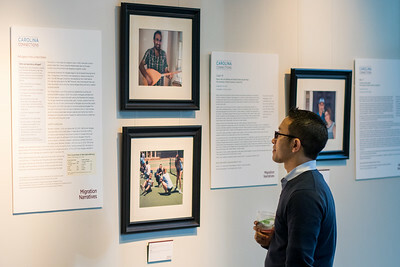 Guests view photos from Home in a New Place, a project which features a Laotian migrant community in Morganton, NC. 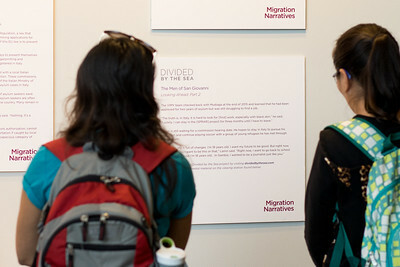 Guests learn about the stories of asylum-seekers in Italy from the Divided by the Sea project. 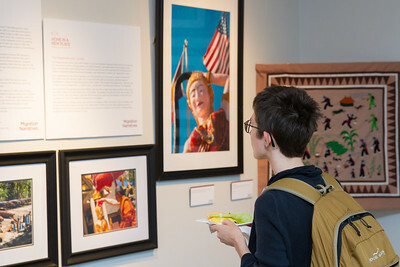 Guests view photos from the project Divided by the Sea. 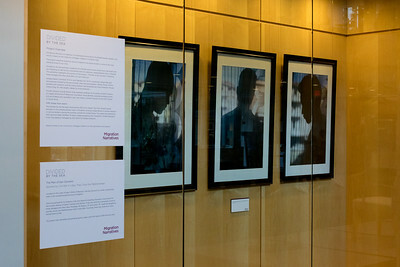 Photos from the Divided by the Sea project display portraits of three men who fled from civil war in Libya to seek refuge in San Giovanni, Italy. 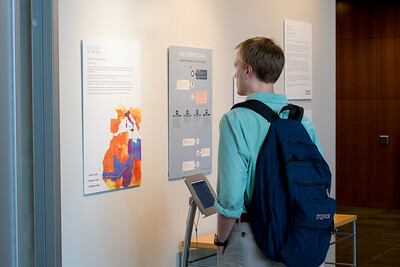 A guest studies the infographics from the project, Divided by the Sea, learning about the journey of asylum-seekers from West Africa to Italy. 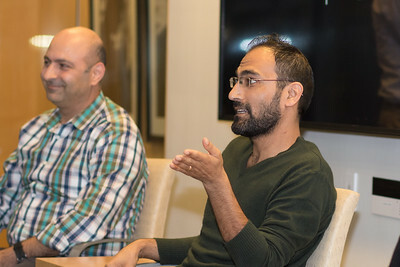 Producers of and participants in the "Migration Narratives" panel discussion pose for a photograph. 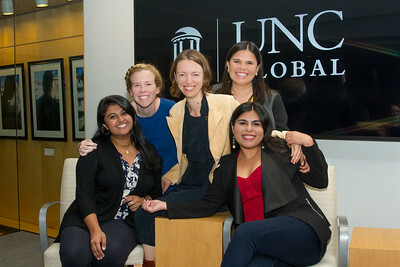 Left to right: Felicia Arriaga, doctoral candidate at Duke University; Bahij ’17; Hannah Gill, director of the Latino Migration Project and New Roots/Nuevas Raíces; Niklaus Steiner, director the Center for Global Initiatives; Laura Villa Torres, bilingual outreach assistant with New Roots/Nuevas Raíces; Ingrid Smith, manager of global events and exhibitions; Zubair ’18; Katie Bowler Young, director of Global Relations; Katy Clune ’15 M.A.